The 3rd Annual Bush Traditions Gathering happened at Bradley Grange, aka the Old Goulburn Brewery, over the weekend 3-6 October 2008. Yea! This year we had on-site camping adding another and very welcome dimension to the Gathering. 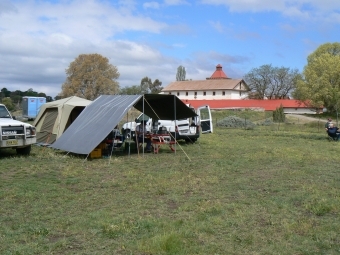 Over half of all participants made use of the 5 acre paddock behind the Brewery to pitch tents and park vans. And there was room for many more. All that negotiating with the Goulburn council turned out to be worth the cost and effort. At the centre of it all was Bill Arnett’s large tarp and tables and Don Brian’s BBQ. These provided a base for others to share meals and company. Even a late night chocolate fondue materialised. 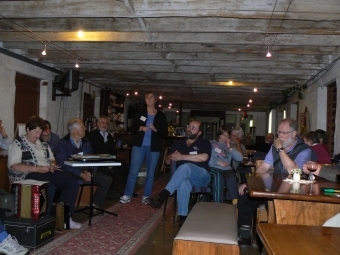 For those who chose there was the opportunity to eat meals in the Brewery, shouldering utensils in company with others from across south eastern Australia. It rained a lot in Goulburn over the weekend but all venues are inside the Brewery and proceedings were unaffected. But it did make access to the paddock a bit interesting by Monday afternoon. 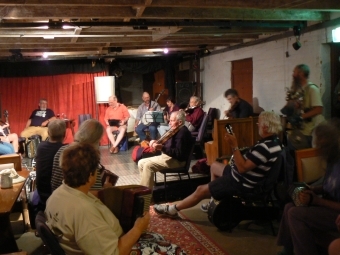 The highlight for me was the way people put themselves forward to lead sessions of tunes and on topics of interest to them. 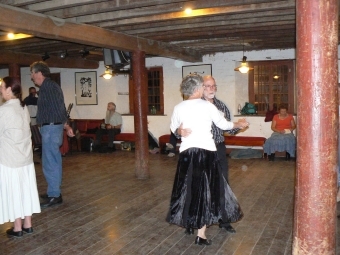 Carol Helman’s session on ‘My favourite Waltzes’ featured the ‘Silver Wattle Waltz’, a waltz that featured again for the dance of that name later in the weekend. 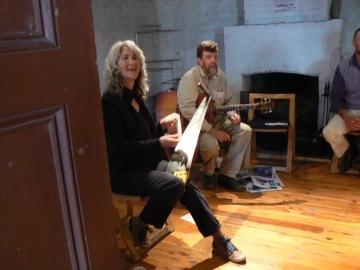 Sue & Pete McMahon led a very enthusiastic bunch through a workshop featuring the musical Saw. Did you know that there is a small company in Europe called Stradivarius who make and sell musical saws? Now you do. Canberra local Alan Johnson demonstrated his technical advances in bush bass. There was also gumleaf 101 for those who were interested and as it turned out Ross West had and could! One small branch of gum leaves made the room smell very pleasant and kept quite a lot of people very busy for quite some time! Others who led session included Harry Gardner and Tom Walsh on fiddle, Alan Musgrove leading Songs from the Broadsides, Bob Hodgson on free reed theory, Peter Ellis with Berrimal-Wedderburn tunes, Chris Woodland with tunes from the Woodland collection in the NLA, Gary Lovejoy on concertina, Margaret Walters presented Women of the Outside Track, Don Brian variously on sea shanties and whistle, Martin Chatfield with some of his favourite tunes, Richard Ayling and Denise Hibbs leading tunes from Nariel. Dave Johnson finished off with rather a lot of schottisches. 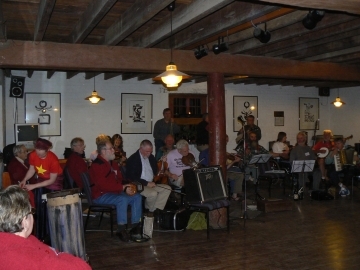 Dave deHugard also hosted two sessions in the Cooperage playing a set of Mudgee Waltzes. This is his latest project and features twelve waltzes collected from people in the Mudgee district by himself and John Meredith. Dave deHugard has recorded these and made the recording available to Bush Traditions. The recording may be heard as a podcast from the Bush Traditions website and soon will be joined by images of the dots. This affords one the opportunity to watch the score while we listen to Dave deHugard play the tune. Furthermore, you can use the technology now available to slow it down and work out how he gets all those chords and what he is doing in the fiddly bits. ‘Media Player’ allows for this but other programs are much more powerful and versatile in this regard e.g. for Mac users the Amazing Slow Downer. Alan Musgrove and Stuart Leslie led No Such Thing through a sequence on Sunday, in what has become a standard format: It begins with a tune workshop, then a dance workshop and finally a dance. It takes most of the day but then there is time for other things in between times. Jim Moir led half the dance on Saturday with the Monaro Colonial dancers leading the other half. Don’t wait to be invited, just join in. And the dancing was tops! The singing was again excellent this year. 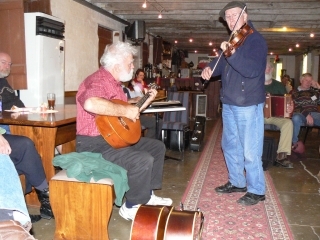 Don Brian, Margaret Walters and John Warner, all members of the Roaring Forties led some song sessions in the Bar. So did Helen and Tony Romeo, Sandra Nixon, Alan Musgrove, Dave de Hugard and Dave Johnson. This was all very informal and inclusive. I can tell you they make a great backing for those with more modest voices. But even as small and manageable an event as the Gathering is there is not enough time to do everything and so I missed lots. If you missed it too then you can still go to the website and see what you missed. Be disappointed but don’t fret because we plan to do it all again next year. After three years the gathering is developing a character all of its own. It is and looks like remaining a relatively small and intimate affair, characterised by sharing and participation, something like a soirée or weekend house party. There is no star system and no one is paid to be there. All organisation is voluntary, primarily by the committee but with the generous help of others, who seem happy to contribute where they can. It’s been a very life affirming experience. This helps keep costs down and allows organisers to charge just $25 for the weekend. This pays for venue hire and the administrative costs of running Bush Traditions. Camping was an additional $25 for the weekend, to cover the cost of providing toilets and showers. That included hot water for most of the time. I want to thank those who: turned out and got involved and made it a memorable weekend; put in the effort to lead a session; helped in many small ways and particularly those who helped out in big ways. Next year the Gathering will be in much the same format but even better. I expect more people will use the on site camping option and hope camping will turn into a major part of the experience. Let me know if you would like to contribute in some way next year, with a bunch of the family songs, or a history of your district in word and music. Also, I would welcome feedback from anyone who has a view on how the weekend went. Your views will be invaluable in building on our experience and planning for better in future. Bush Traditions next project is a weekend of dance being planned for Bundanoon on the long weekend in June next year. Mark it on your calendar.